Education is important to everyone and emerging leaders representing a variety of organizations, agencies and businesses participate in the SC Education Policy Fellowship Program (SC EPFP). The myriad challenges to education posed by new changes in federal level policy, the national recession, and severe state budget cuts that threaten South Carolina's legislated focus on educational accountability and improvement add urgency to the need for education leadership statewide. 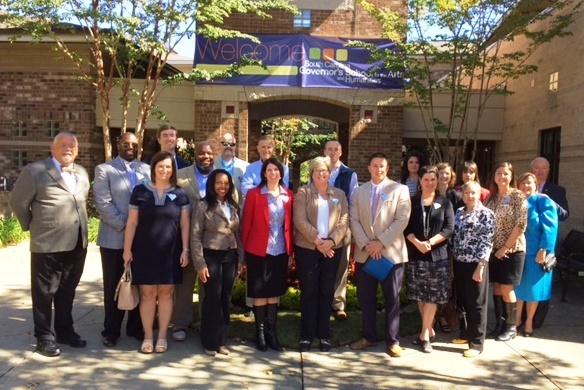 The 2015-16 South Carolina EPFP cohort at the South Carolina Governor's School for the Arts and Humanities. The South Carolina Education Policy Fellows Program (SC-EPFP) is a part of a nationally-respected leadership development program affiliated with the Institute for Educational Leadership in Washington, DC. South Carolina’s EPFP is sponsored by several organizations: the SC Department of Education, SC Association of School Administrators, SC School Boards Association, Education Oversight Committee, SC Chamber of Commerce, The University of South Carolina, Clemson University and Blue Ribbon Schools for Excellence. Although these organizations may hold diverse purposes and views, they join together in a commitment to thoughtful, informed participation in a democracy. For several years a cadre of mid-career professionals from a wide range of disciplines has participated in a monthly professional development program to build understanding of education policy formation at the local, state and national levels. Cohort members also participate in the Washington Policy Seminar with Fellows from other states. During this spring trip to Washington, Fellows also meet with members of South Carolina’s Congressional delegation and prominent staff. The program is coordinated by the SCDE Office of School Leadership and the SC School Improvement Council (SC-SIC), the program begins in September and goes through June. Additional information can be found on the SC-SIC/EPFP website.